A new web report from the Australian Institute of Health and Welfare (AIHW) shows that palliative care-related hospitalisations have risen by over 50% in the last decade. Palliative care aims to improve the quality of life of patients and their families facing a life-threatening illness, through the prevention and relief of suffering. The report, Palliative care services in Australia 2015, shows that there were almost 62,000 palliative care hospitalisations in 2012-13. This was an increase of 52% since 2003-04, when there were 40,435 hospitalisations. 'Contributing to this increase are the changing patterns of disease we see towards the end of people's lives-the increasing prevalence of chronic illnesses, which people are more likely to die from, is leading to greater use of palliative care services,' said AIHW spokesperson Geoff Neideck. In addition, the growth and ageing of the Australian population is increasing demand for palliative care services. 'As we would expect, palliative care services are accessed more frequently by older people-people aged 75 years and over accounted for just over half of all palliative care hospitalisations,' Mr Neideck said. About 10% of palliative care hospitalisations were for people aged under 55 years. The report also shows that over half (56%) of palliative care hospitalisations were for patients with cancer. For certain types of cancer, palliative care played a particularly prominent role in patients' hospital care. 'For example, almost one-third of all hospitalisations related to pancreatic cancer were palliative care-related,' Mr Neideck said. An important element of palliative care is prescription medication. 'At the core of palliative care is the aim to provide relief from pain and other distressing symptoms, and medication can be central to this,' Mr Neideck said. Nationally, there were more than 51,200 palliative care-related prescriptions provided to almost 25,900 patients in 2013-14. Of these patients, 87% received Australian Government subsidised prescription medications, reflecting a 13% average annual increase over the preceding five years. Laxatives were the palliative care-related prescription most often dispensed, followed by analgesics and anti-epileptics. Since our last update we have held a further 80 meetings and teleconferences aimed at testing draft revised zoning options. These meetings through July and August were specifically targeted at those who were likely to be affected by the changes we were proposing, and allowed us to ask stakeholders directly whether there were any further issues that would require us to refine our recommendations before finalising our report to government. The testing of zoning options was generally well received with stakeholders providing very constructive feedback. Again we have found the balancing of competing interests challenging as once more we heard differing views on zonation for the reserves. We did, however, identify a small number of key areas where we were able to make further improvements. We are again very thankful for the contributions from individuals and organisations and the time they have invested in the process. We are confident that our recommendations are all the better for the insight and specific knowledge that we have been provided. Our focus is on finalising our recommendations to government. We continue to balance the extent to which our options will improve conservation and/or socio-economic outcomes, or how they will make it easier for users to comply with or Parks Australia to manage the areas in the future. Our recommendations are being heavily informed by the feedback and suggestions that were provided by stakeholders at our meetings, via written submission and our online survey. We are progressing to complete our recommendations and report in the coming weeks. The Environmental Impact Statement for a major coal mine project in the picturesque Bylong Valley in the upper reaches of the Hunter catchment has been placed on public exhibition this morning, prompting calls for the NSW government to fix major gaps in mining and planning laws before more farmland and water resources are permanently lost to mining. Lock the Gate Hunter region coordinator Steve Phillips said, “This project will potentially affect 440ha of mapped strategic agricultural land, and permanently remove 200ha of that land. A further 117ha of equine critical industry cluster land will be directly affected by the mine. These lands were supposed to have been made off limits to coal mining years ago but the Government has utterly failed to deliver promises to protect farmland from mining. “The proponent’s own studies indicate that this project will mean the loss of $2.6 million in agricultural productivity. “Has the New South Wales Government learned nothing from the backlash to the Shenhua Watermark project? How much more of our farmland needs to be lost to coal mining before the Government gets off its hands and creates the no-go zones that the community expects and demands? One of the most serious problems with the mine will be its impact on water. “The EIS reveals the dramatic damage this mine would do to the Bylong River and its productive alluvial aquifer if it were allowed to proceed. It appears that it will triple water demand in the Bylong Valley, and draw down the river’s alluvial aquifer. “NSW’s lack of clear legally binding thresholds to prevent damage and loss of this productive groundwater is leading to long-term damage and it needs to be addressed before any more of these damaging projects go through our very compromised planning process,” said Phillips. A proposal to expand Springvale mine’s underground mining area allowing it to operate for another 13 years has been referred back to the independent Planning Assessment Commission for a final decision. “The application has been put under the microscope through a number of extensive reviews, involving analysis by independent experts and community consultation,” a Department of Planning and Environment spokesperson said. • an action and monitoring plan for the Upper Coxs River. The proposal was previously subject to two reviews by the Commission. The Department’s recommended conditions are based on the findings of those reviews. Springvale Mine is the only local coal source for the Mt Piper Power Station, which provides 15 per cent of the State’s electricity. The spokesperson said the expansion would secure 310 full-time jobs and an additional 60 jobs during construction as well as 1,200 indirect jobs across NSW. The Commission will now make the final determination on the project, taking into account the Department’s final assessment and community feedback. If the proposal is approved by the Commission, it will be subject to regular inspection and review by the Department’s Compliance Officers who will ensure the mine is adhering to its conditions. For more information about the proposal and to view the Department’s assessment of the project, visit www.majorprojects.planning.nsw.gov.au. The clean-up of the Wollangambe River is continuing following the incident at the Clarence Colliery mine on the 2 July 2015. Gary Whytcross, NSW Environment Protection Authority (EPA) Director South, said as of 7 September 2015, 48.6 tonnes of wet coal fines had been removed from approximately 1.9 km of the Wollangambe River to date. “Centennial Coal is continuing with its clean-up of the Wollangambe River following the serious incident in July this year. “The EPA has been inspecting the clean-up operation and is satisfied that the coal fines, being mostly removed by hand at this stage, are being taken out in a way that does not risk further damage to the environment. “The NPWS has also been accompanying the EPA on some inspections. Mr Whytcross said that in addition to the work on the river the EPA has also been inspecting the clean-up of the drainage line. “On 8 September 2015 the EPA inspected the clean-up of the drainage line on the hillside that has been completed. The affected area is now being rehabilitated, and the EPA will ensure that some sediment control structures remain in place while this work is being done,” Mr Whytcross said. The EPA is continuing to keep a close eye on work being undertaken by Centennial Coal and will continue to monitor the clean-up works on a regular basis. The EPA’s investigations into the incident are ongoing. Two remediation projects are to be undertaken in Sydney to clean up contamination from the former Millers Point Gasworks, which closed almost a century ago. Celebrate National Bird Week 2015 by taking part in the biggest citizen science project to hit Aussie shores! From 19-25 October, thousands of people from across the country are heading out into their backyards, local parks or favourite open spaces to take part in the second annual AUSSIE BACKYARD BIRD COUNT! To get involved all you need is 20 minutes, your ‘green patch’ of choice, and some keen eyesight (or binoculars!) And it doesn’t matter if you’re a novice or an expert—we’ll be there to help you out along the way. Simply record the birds you know and look up those you don’t on our Aussie Bird Count app (updated version available for download in September) or our website. You’ll instantly see live statistics and information on how many people are taking part near you and the number of birds and species counted across your neighbourhood and the whole of Australia! Register now and we’ll keep you up to date with exciting Aussie Backyard Bird Count news! A proposal to construct and operate an open cut and underground mine in mid-western NSW will be on exhibition from today for community feedback. The proposed project would be located approximately 55 kilometres northeast of Mudgee. • progressively rehabilitate the site. The proposal and its environmental, social and economic impacts will be thoroughly assessed against rules set out in the Environmental Planning and Assessment Act. It will also be subject to an independent review by the Commonwealth Independent Expert Scientific Committee. A public information session on how to make a submission will be held by the Department during the exhibition period. “Community consultation is an integral part of the planning process and the applicant will have to respond to the feedback we receive and this is taken into consideration when we develop our recommendations,” the spokesperson said. To make a submission or view the environmental impact statement, visit www.majorprojects.planning.nsw.gov.au. Submissions can be made from Wednesday 23 September until Friday, 6 November 2015. A new Bill passed by NSW Parliament yesterday will water down protections for Sydney’s drinking water catchment, and prescribed dams across the state, from mining activities. The NSW Government’s “Dam Safety Bill 2015” was introduced to replace the Dam Safety Act 1978. Among the provisions of the Bill are changes to the powers of the Dam Safety Committee regarding mining leases. Currently, under s91 of the Mining Act, the Dam Safety Committee has the power to object to a mining lease within the “notification area” for a prescribed dam. It also has the power to recommend changes to the conditions of mining leases over dam notification areas. The new Dam Safety Bill will remove these provisions from the Mining Act and replace them with a far weaker requirement that mining leases in these notification areas be referred to Dam Safety Committee for comment, and that comment be taken into consideration by an authority considering a development application for a mine in the area. Lock the Gate NSW Coordinator Georgina Woods said, “At a time when the impacts of coal mining on water resources are causing profound concern and the Government is under heavy criticism for insufficient regulation to protect water resources from coal mining, it is pretty alarming to see them bringing forward legislation to remove checks and balances for coal mines. “For State Significant coal projects, there’s very little control by the Government agencies responsible for water, biodiversity, agricultural land and health: they do not have the power to refuse permits and licences once mines have approval from the Planning and Assessment Commission. In the case of the Dam Safety Committee, this was one stop gap that remained in place – and for good reason, since the Committee has warned about loss of water and capacity in Sydney’s dams as a result of fractures caused by nearby mines. • According to the Dam Safety Committee’s Annual Report for 2013/14, over 28 million tonnes of coal were extracted near prescribed dams in NSW in that year, and the Committee considered 27 new applications for mining near dams. • At present, three mining companies operate longwall coal mining operations under the Metropolitan Special Area that surrounds the Cataract, Cordeaux, Avon and Nepean Dams, and the Woronora Special Area that surrounds Woronora Dam. • WaterNSW opposes any longwall mining located within the Dams Safety Committee notification areas surrounding WaterNSW’s dams in the Declared Catchment, or elsewhere, where it is predicted to damage Sydney drinking water supply infrastructure. Lock the Gate Alliance says the NSW Government is putting the cart before the horse by implementing a compensation regime for the impacts of coal seam gas on landholders before comprehensive regulatory protections are in place and before the Chief Scientists recommendations have been fully implemented. At the request of the Government, the Independent Pricing and Regulatory Tribunal (IPART) today released a new model for setting benchmark compensation rates as a guide for NSW landholders negotiating land access agreements with coal seam gas (CSG) companies. IPART has released their draft report today, and is seeking community feedback on it. “The NSW Government has talked about needing better protection for landholders and farmers against coal seam gas but it has come up short on action,” said Phil Laird, spokesperson for the Lock the Gate Alliance. “Compensation benchmarks for farmers and landholders should only be set once the right laws and planning processes are in place that protect water, land and communities from CSG exploration and production. “Until these proper checks and balances are in place, compensation requirements are unknown and premature discussion of compensation continues the disturbing trend of expansion by the gas industry ahead of appropriate regulation, then trying to fix it up afterward. “There is no current legislative mechanism to restrain the areas where CSG can occur, even though it was recommended nearly a year ago by the Chief Scientist. “Instead, the CSG industry can operate in the most sensitive environments - including important aquifer recharge areas, water catchments, geologically risky areas and crucial food and fibre-producing areas. “On Monday next week, it will be one year since the Chief Scientist delivered her report and still some of the most important recommendations have not been implemented by the Baird Government. “Since then gas demand has declined in NSW and there is absolutely no reason to rush the development of this risky industry. “We call on the Government to make public a clear timetable for the full implementation of the Chief Scientist's recommendations, and to support the moratorium Bill currently in parliament to ensure the gas industry does not get ahead of the regulation and do irreversible harm, before the proper controls are in place,” he said. Environment Minister Mark Speakman has announced the second round of installing GPS tracking collars on koalas in the first-ever study of the mammals in the NSW Southern Highlands. Mr Speakman said he anticipated the final 10 of 20 koalas would be fitted with collars over the next month. Mr Speakman said the $155,000 Southern Highlands Koala Conservation Project was a partnership between the NSW Office of Environment and Heritage, Wingecarribee Shire Council, the University of Sydney and the Foundation for National Parks and Wildlife. “OEH’s $85,000 contribution comes from a four year $1.48 million program to protect the long-term future of five iconic species including the koala. Other projects to protect the koala include supporting local government to survey koalas, map their habitat and develop comprehensive plans of management. OEH also has undertaken research using long-term data sets to monitor change and evaluate the degree of success of earlier koala conservation efforts. “The government also has allocated $100 million over five years starting from 2016 for the Saving our Species program to protect our threatened flora and fauna,” Mr Speakman said. As an iconic species, the koala will be a priority for investment of the $100 million, however the distribution of funding for the SoS program is still being developed. Since the launch of the SoS program in 2012, $717,000 has been spent on Koala conservation projects and a further $120,000 is committed for this financial year. The project will help us to understand: how many koalas there are and where they live;• how they move about and the routes they take;• the main risks to these koalas, such as being hit by cars or disease;• what gum trees they like to eat, so these can be used for replanting projects in the area. ASIC lawyers this week won an award for their pro-bono volunteering work in helping young people. The award, from National Association for Prevention of Child Abuse and Neglect, recognised the work of 38 ASIC lawyers. These ASIC staff volunteer with the National Children’s and Youth Law Centre (NCYLC) Cyber Project, which is supported by ASIC, Telstra and law firm King & Wood Mallesons (KWM). The award was shared with lawyers from other supporting organisations. Through its Cyber Project initiatives Lawmail and Lawstuff, NCYLC provides free legal advice to young people with lawyers volunteering two hours a month, to answer email from children and young people. Around 44 ASIC lawyers have volunteered since 2012 from Perth, Brisbane, Sydney and Melbourne. 'Volunteering is a big part of the ASIC culture and spending time helping young people needing legal advice is a great way our lawyers can give back to the community,' said ASIC chief legal officer Michael Kingston. The awards were presented to representatives of these organisations by his Excellency the Governor General of Australia, Sir Peter Cosgrove, at Admiralty House Kirribilli. Thomas Hough, who is the ASIC Sydney Coordinator for NCYLC, represented ASIC at this event. ASIC, KWM and Telstra were also nominated as joint finalists for the Annual Australian Law Awards Pro Bono Program of the year. The Award ceremony took place at the Westin Sydney on 17 September, and the winner was Salvo Legal. NCYLC is a community legal centre dedicated to providing advice to children and young people. NCYLC has developed a Cyber Project called Lawmail, which allows young people to easily access free legal advice from anywhere in Australia, at any time. NCYLC was set up to ensure children’s rights are not marginalised or ignored. NCYLC helps children across Australia with their problems, including abuse and neglect. The AGD, UNSW, KWM, Telstra and ASIC collaborate by providing financial, in-kind and/or pro bono volunteer resources to NCYLC to operate Lawmail and/or Lawstuff. In 2014, Lawmail helped over 1600 people, with 211 of these cases involving help to children under 18 with online safety. A further 337 children were helped with family disputes, child abuse or neglect. An amazing 1.1 million children, young people and their advocates accessed Lawstuff’ s pages including those dealing with child abuse or violence, and 224, 000 of these viewed the new pages relating to online safety and mobile phones. The Cancer Institute NSW provides statewide strategic direction for cancer control in NSW and has a 12 year history in developing and implementing activities that support the community to decrease their risk of cancers, utilise cancer screening services and access world class treatment services. The Cancer Institute NSW is seeking your comments on the draft NSW Cancer Plan 2016-2020. This draft has been developed following a substantial consultation process to date on key areas of cancer control in NSW with a range of partners and stakeholders, via nine workshops held in February-May 2015, including two consultation and formative research processes with Aboriginal communities and Culturally and Linguistically Diverse communities. Thank you to those that have contributed as part of this process. The draft plan also highlights the importance of focusing particular attention on priority populations and priority cancers to both improve cancer outcomes and lessen the gap for groups within the community who experience poorer outcomes. Thank you for your support and involvement in the implementation of the current NSW Cancer Plan 2011-2015. We look forward to receiving your feedback on the draft state-wide Cancer Plan for 2016-2020 and working with you to further reduce the burden of cancer in our community. Please provide your comments and feedback on the draft plan via our online survey by 30 October 2015. Additional comments can be sent tocancerplanfeedback@cancerinstitute.org.au. Thank you for taking the time to complete this survey and review the draft NSW Cancer Plan 2016-2020. Your assistance is greatly appreciated. 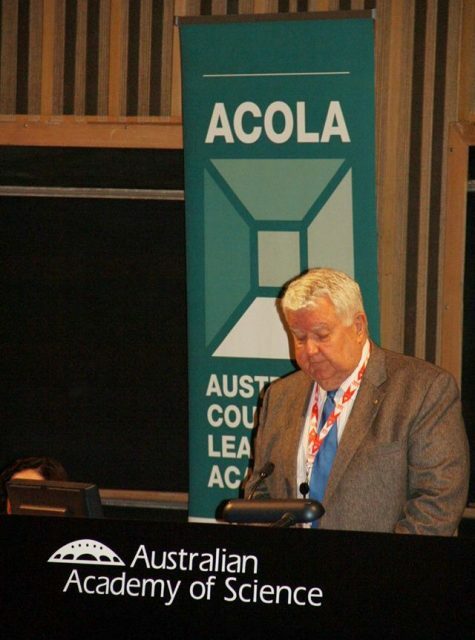 On 23 September, the Chief Scientist launched a new report by the Australian Council of Learned Academies (ACOLA) entitled Technology and Australia’s Future. Read Professor Chubb’s speech below. You can view the full report on the ACOLA website. About 2.6 million years ago a human ancestor picked up a rock somewhere in East Africa and knocked off a bit to make a sharp-edged flake. Before that, we were users of tools. Now we were toolmakers – and we might say that tools had begun to make us. But our ancestor didn’t know that when he or she picked up the rock. We didn’t come together as a tribe, much less as a species, and decide on the balance of the evidence that tool-making was going to serve humanity well. We didn’t envisage that tools would in time allow our descendants to spread across the Earth and dominate all other forms of life. We didn’t foresee that food could come in packets, water from a tap, light at the flick of a switch. We didn’t imagine all the gadgets on which we now collectively spend about US$1 trillion, every year. But nor did we imagine the 42 million tonnes of unwanted gadgets dumped in 2014 alone. Nor did we think about the 8 million tonnes of plastic waste that enter the oceans, every year. Nor did we worry that human beings would acquire the technologies to build the capacity to destroy themselves – in ever more ingenious ways. We saw only what we wanted, and a way to bring it about. And so we have continued to this day – in little steps or bigger leaps, never knowing where they would take us over time. There is no inevitable path. There is no guarantee that the steps will be wise, or that humanity will be better off because we took them – next year, next century, next millennium. There are only fallible people, with short memories, and limited imaginations, making choices, as best they know how. Today we are a world of some 7 billion people, heading to a world of 9 if not 10 billion people by 2100. So how do we make the decisions about the technologies that will make us who we are? And how do we maximise the chances that our decisions will ultimately serve us and our descendants well? In short: how do we face the future? In the past, we might have set out to be ‘future-proof’. Our Prime Minister has observed, and he repeated it last week, that the phrase is well-meaning, but unhelpful. You build a bomb-proof shelter to be safe from bombs. You build a rabbit-proof fence to keep out the rabbits. But the future is not a threat from which we need protection – or can be protected. It is something we can shape by our actions today. So instead of future-proofing we ought to talk about future-priming – building those assets and skills that position us to benefit as best we can from change. That, on my reading, is the challenge that has been put to us, as people who reflect and occasionally offer opinions on these things. So this is a timely paper from the Australian Council of Learned Academies (ACOLA). It was one of the initial six papers commissioned in the Securing Australia’s Future series in June 2012. The intent behind this series was simple: we can’t know the future, but we ought to know it’s going to be different, so we may as well think as constructively as we can about how to make it better. How to focus on opportunity, not anxiety. We have many tools across the research community for thinking about the opportunities: tools developed within different disciplines, which help us see a richer and more complex picture than any one perspective alone. So when the Office of the Chief Scientist and the Australian Research Council (ARC) got together to commission this program and these papers, we did so quite deliberately through ACOLA. We wanted to bring together the expertise and the perspectives of the different disciplines that are found within the four academies. We also wanted to look at the chosen topics all the way to the horizon. This was a reflection of the fact that the government of the day (and several of the ministers) were losing interest when the agenda of Prime Minister’s Science Engineering and Innovation Council (PMSEIC) was so far ahead of the exigencies with which they had to deal that it had little immediate relevance to their needs today. We had to develop a process that would give advice on the immediate to short-term, as well as advice about positioning on some topics that would see us well prepared for the medium to longer term. We did, and this Securing Australia’s Future program is part of the latter. Our final requirement as the contractors was that the reports should provide evidence from which recommendations could be drawn – by a group using the evidence provided but comprising people mostly outside the Expert Working Group (EWG). That is to say, the Chief Scientist, together with the chair of the EWG and officials would draft recommendations for consideration by government. It was the feeling that a more ‘arm’s length’ approach to recommendations, relying on the evidence provided, would have the weight of them not being put together by experts with a particular interest. I have seen no reason to change that feeling. Other speakers will expand more fully on the findings of this report – talk about the evidence, if you like – but to me the take-home message is simple. We are not just a species that uses technology. We are a society of technology users. So every one of us needs to be part of that society, and the education to be able to contribute meaningfully to deliberations about the way forward. And if enough of us have that grounding, beginning in primary school if not pre-school, then from it will flow the pipeline of STEM-trained people we require. People with the encouragement and support to be the scientists, technologists, engineers and mathematicians who will provide us with the opportunities to survive and prosper in a competitive, probably hostile world. And STEM literate people who will help us to make the ‘moral judgement’ that Tony Blair once talked about – because we all know that technology can be used for good or for ill.
We have to choose, and fear-mongering feeding off ignorance is hardly a healthy part of the conversation. We have to be better than that. And STEM communication will be a key. People will need to see the difference between evidence and snake oil. Alongside this, we must remember the importance of the humanities and the social sciences. It is they which will play an important part in the future: from the design and development of technologies to the decisions we will have to make, the understanding of where we came from, how we got there (or here) and the societal implications and possible responses to certain action or inaction. There is not one piece of this puzzle that is not important to the nation, indeed to the world, that we are trying to build. The key to it all is education. • Education that allows individuals to pursue many different paths, but gives them a common language and sense of purpose. • Education that teaches us our history in ways that help us shape the future. • Education that engages us, excites us, inspires us. It is an important message and a worthy outcome of this report. So 2.6 million years ago a human ancestor picked up a rock. I’m glad he or she did. I hope that our descendants, whoever they are and wherever they are, will be glad for the decisions we made. On that note, I am pleased to launch Technology and Australia’s Future. Smithsonian National Institute of Natural History, ‘What Does It Mean to be Human? Tools and Food’. Available http://humanorigins.si.edu/human-characteristics/tools-food. Variety, “Electronics posts record 1 trillion in sales driven by new smartphones, tablets”, January 5, 2015. Available: http://variety.com/2015/digital/news/electronics-biz-posts-record-1-trillion-in-sales-driven-by-new-smartphones-tablets-1201392613/. Baldé, C.P., Wang, F., Kuehr, R., Huisman, J. (2015), The global e-waste monitor – 2014, United Nations University, IAS – SCYCLE, Bonn, Germany. Jambeck et al, “Plastic waste inputs from land into the ocean,” Science 13 February 2015: Vol. 347 no. 6223 pp. 768-771. A new study shows that depressive symptoms are extremely common in people who have obstructive sleep apnea, and these symptoms improve significantly when sleep apnea is treated with continuous positive airway pressure therapy. Results show that nearly 73 percent of sleep apnea patients (213 of 293 patients) had clinically significant depressive symptoms at baseline, with a similar symptom prevalence between men and women. These symptoms increased progressively and independently with sleep apnea severity. However, clinically significant depressive symptoms remained in only 4 percent of the sleep apnea patients who adhered to CPAP therapy for 3 months (9 of 228 patients). Of the 41 treatment adherent patients who reported baseline feelings of self-harm or that they would be "better dead," none reported persisting suicidal thoughts at the 3-month follow-up. "Effective treatment of obstructive sleep apnea resulted in substantial improvement in depressive symptoms, including suicidal ideation," said senior author David R. Hillman, MD, clinical professor at the University of Western Australia and sleep physician at the Sir Charles Gairdner Hospital in Perth. "The findings highlight the potential for sleep apnea, a notoriously underdiagnosed condition, to be misdiagnosed as depression." Study results are published in the September issue of the Journal of Clinical Sleep Medicine. The American Academy of Sleep Medicine reports that obstructive sleep apnea (OSA) is a common sleep disease afflicting at least 25 million adults in the U.S. Untreated sleep apnea increases the risk of other chronic health problems including heart disease, high blood pressure, Type 2 diabetes, stroke and depression. The study group comprised 426 new patients referred to a hospital sleep center for evaluation of suspected sleep apnea, including 243 males and 183 females. Participants had a mean age of 52 years. Depressive symptoms were assessed using the validated Patient Health Questionnaire (PHQ-9), and the presence of obstructive sleep apnea was determined objectively using overnight, in-lab polysomnography. Of the 293 patients who were diagnosed with sleep apnea and prescribed CPAP therapy, 228 were treatment adherent, which was defined as using CPAP therapy for an average of 5 hours or more per night for 3 months. According to the authors, the results emphasize the importance of screening people with depressive symptoms for obstructive sleep apnea. These patients should be asked about common sleep apnea symptoms including habitual snoring, witnessed breathing pauses, disrupted sleep, and excessive daytime sleepiness. Take a peek at Sydney's new ferries. The first ferry will be running by the end of 2016. The ABC is thrilled to announce that arts content from Australia and around the world has just become even more accessible and inclusive with the launch of the ABC Arts channel available exclusively on iview. The dedicated channel features original and hand-picked, high quality arts content that’s guaranteed to engage, excite and delight audiences. ABC Arts on iview is where life and culture collide, providing a diverse range of content. From photography to travel, sculpture to music, painting, dance, animation, theatre along with news, reviews and interviews with artists, musicians and provocateurs, plus so much more. • The Critics with Zan Rowe, a new review show dissecting screen culture from film to video art and the latest web series. ABC Arts on iview also brings you cult art shows from abroad, such as Park Bench with Steve Buscemi, plus hours of clips from the extensive ABC archives including rarely seen live performances and interviews by Public Enemy, Bon Scott, Regurgitator, Silverchair, Oren Ambarchi, Midnight Oil and more. A simple, low-cost automated program of semi-personalized mobile phone text messages supporting lifestyle change led to improvement in low-density lipoprotein cholesterol (LDL-C) levels, blood pressure, body mass index, and smoking status in patients with coronary heart disease, according to a study in the September 22/29 issue ofJAMA. Globally, cardiovascular disease is the leading cause of death and disease burden. Cardiovascular disease prevention, including lifestyle modification, is important but underutilized. Mobile phone text messages to remind, encourage, and motivate patients regarding the adoption of healthy lifestyles might be useful, but there has been limited scientific evaluation of these interventions, according to background information in the article. Clara K. Chow, M.B.B.S., Ph.D., of the George Institute for Global Health, University of Sydney, Australia, and colleagues randomly assigned patients with proven coronary heart disease to receive 4 text messages per week for 6 months in addition to usual care (intervention group; n = 352) or usual care (control group; n=358). Text messages provided advice, motivational reminders, and support to change lifestyle behaviors. Messages for each participant were selected from a bank of messages according to baseline characteristics (e.g., smoking) and delivered via an automated computerized message management system. The average age of the patients was 58 years; 53 percent were current smokers. At six months, levels of LDL-C were lower in intervention participants (79 mg/dL vs 84 mg/dL), as was systolic blood pressure (128 mm Hg vs 136 mm Hg) and body mass index. After six months, there was also a lower percentage (26 percent vs 43 percent) of smokers in the intervention group, who also reported an increase in physical activity. The proportion of patients achieving 3 of 5 guideline target levels of risk factors were substantially higher in the intervention group vs the control group (63 percent vs. 34 percent). The majority of participants reported the text messages to be useful (91 percent), easy to understand (97 percent), and appropriate in frequency (86 percent). "The duration of these effects and hence whether they result in improved clinical outcomes remain to be determined," the authors conclude. Editorial: Can Mobile Health Applications Facilitate Meaningful Behavior Change? Zubin J. Eapen, M.D., M.H.S., and Eric D. Peterson, M.D., M.P.H., of the Duke Clinical Research Institute, Durham, N.C., (Dr. Peterson is also Associate Editor, JAMA) comment in an accompanying editorial. "Health care needs to be challenged to make its evaluation as nimble as that of technology. The U.S. health care system needs to be capable of testing novel low-risk interventions such as text messaging in the context of routine clinical care. Creating an agile and clinically integrated research framework that rigorously evaluates all interventions--drug, device, or digital--is a collective responsibility and challenge for both app developers and health care practitioners. Solving this dilemma can enable the development and use of pragmatic, scalable, and evidence-based solutions that can address a massive problem like cardiovascular disease." The above is reprinted from materials provided by The JAMA Network Journals. Targeting sitting time, rather than physical activity, is the most effective way to reduce prolonged sitting, according to the first comprehensive review of strategies designed to reduce sitting time. The research, led by the Institute of Psychiatry, Psychology & Neuroscience (IoPPN) at King's College London, is published in the journal Health Psychology Review. Prolonged sitting has become a serious public health concern, with modern lifestyles becoming increasingly sedentary and many professions requiring workers to sit for most of the day. Previous studies and reviews have shown that higher levels of sitting are linked with cancer, diabetes, heart disease and even an early death, independently of whether a person takes regular exercise. Public health interventions have the potential to reduce prolonged sitting, but until now, little has been known about what makes certain sitting reduction strategies effective. For the first time, this new study has shown that increasing levels of physical activity is likely to be much less effective at reducing prolonged sitting than directly attempting to decrease sitting time. The research team, led by Dr Benjamin Gardner, from the Department of Psychology at the IoPPN, King's College London, searched the current existing literature on trials of interventions that sought to reduce sitting time. The team then categorised these studies according to their effectiveness, and examined the strategies that had been used in each trial to try to reduce sitting. The studies were deemed promising, where those who received the intervention did reduce sitting time, or not promising, where the interventions did not reduce sitting time. Out of the 38 interventions assessed, a majority of 23 (60 per cent) were found promising whilst 15 (39 per cent) were found not promising. Some of the promising interventions included the provision of sit-stand desks at work, though other techniques such as encouraging people to keep records of their own sitting time, setting individual goals for limiting sitting time, and using prompts and cues to remind people to stop them sitting, were also found to help reduce sitting time, even when used in isolation. In addition, effective interventions tended to educate people about the health benefits of reducing their sitting time. In view of their study, the researchers now recommend that sitting time should be viewed as a separate behaviour change target to physical activity. They hope their findings can be used by public health workers and policy makers responsible for designing new interventions to reduce sitting time and improve the overall health of those who may sit for prolonged periods. Dr Benjamin Gardner at King's College London, said: 'These findings will be of interest to researchers and practitioners designing new ways to reduce prolonged sitting, because they suggest which strategies may be most fruitful. Professor Stuart Biddle, at Victoria University in Australia and co-author of the study, added: 'The ill effects of high levels of sitting may prove to be especially damaging given that so many people sit for long periods.